Oh, I forgot it. Sorry, but I would like to join it again. This time I will keep update my day. 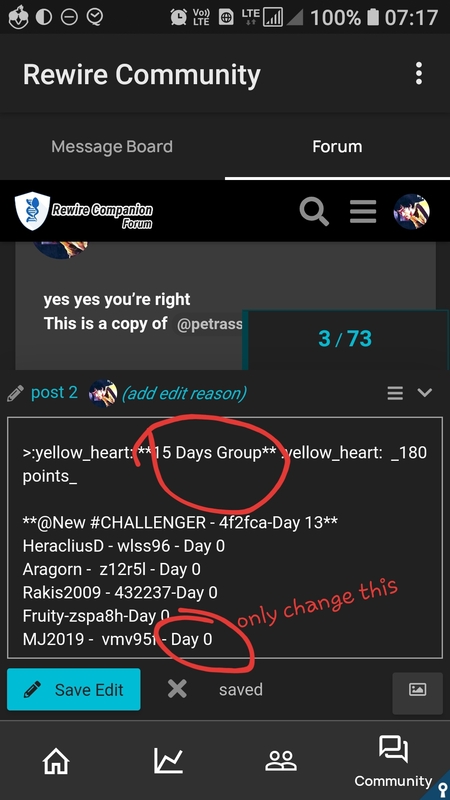 So, I will start with 30 days group. @BruceLee I didn’t understand the question. 100 days group would be just fine. But do i have to update it regularly? @ankush2 If you are in 100 days group then you should update at least once in 30 days. Which group do you wanna join, what is your sharing code? I don’t see an edit button at the bottom of the score board. 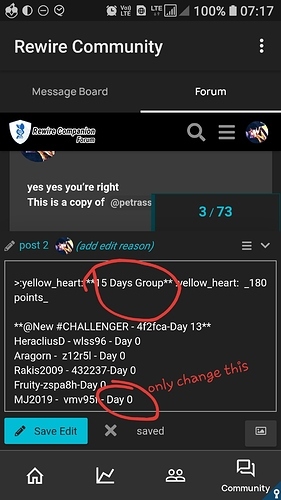 How can I enter the 15 day challenge? You are a basic user… spend some time in forum… you would be able to edit the scoreboard. Scoreboard is on page no. 2 of this topic. I add you just tell me your sharing code ? Uh…did I do that right? I am Soo confused right now. I just edited the scoreboard. Was that how I was supposed to do it? Apps are kind of like a foreign language to me. I’ve added you, you just have to update your streak " Day 0"
Very less takers for this grp… Common guys. Still in it to win it! I’m still here, and about to match my highest streak tomorrow (7 days)! All thanks to you all and the challenges!